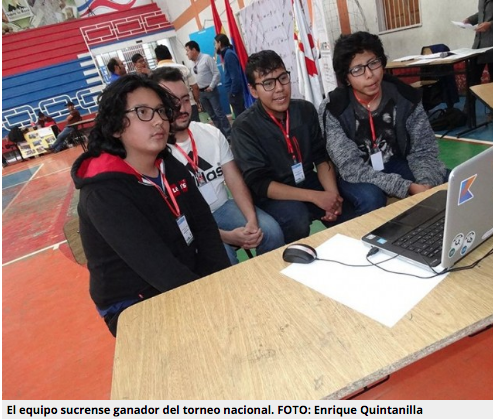 A sucrense team made up of three schoolboys and their tutor was the winner of the 1st National Robotics Tournament that took place today, in Sucre, whose main prize is the World Robotics World Championship First Global Challenge, on behalf of Bolivia. Brian Durán, 16 years old, Jhon Peter Santa Cruz (16) and Eduardo Vargas (14) are the three students that were named winners this afternoon, after passing several tests and previous phases, under the name of “Interconnected”. with the support of their tutor José Octavio Subirana. The world event will be in Mexico between August 15 and 18 of this year.